The Council of Arab Economic Unity (CAEU) has outlined its new vision aimed at digital inclusion, knowledge-based legislative and technology infrastructure, and public and private frameworks that will boost security, welfare and prosperity for the Arab societies. “A common vision for Arab Digital Economy” is the bold plan driven by the council at the League of Arab States to boost political and social stability in the Arab World through Digital Economy. Dr Ali Mohammed Al Khouri, an advisor to the Council of Arab Economic Unity, said that the initiative received the support of Sheikh Mohammed bin Zayed Al Nahyan, Crown Prince of Abu Dhabi and Deputy Supreme Commander of the UAE’s Armed Forces. The UAE’s support for the common Arab vision will promote a joint Arab action, he stated. Al Khouri stressed on the importance of the role of technology as a tool to achieve the objectives of sustainable development and economic growth rates through creation of investments opportunities, employment and opening of new markets. According to him, the UAE is renowned for its knowledge-based approach and youth empowerment. It has been fostering a number of initiatives for skills development like the one million Arab coders project and the e-learning platform offering over 50 million Arab students across the world access to education among other projects that support sustainable development for the Arab societies. 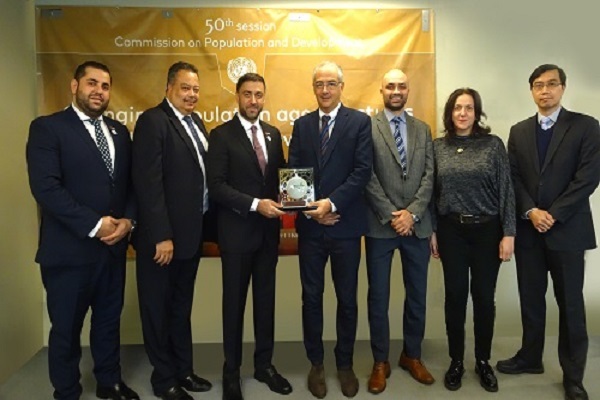 The CAEU delegation met Mourad Wahba, Assistant Secretary-General, Assistant Administration and Regional Director for Arab States at UNDP and with senior officials from the United Nation’s Division for public institutions & Digital Government. Al Khouri noted that the investments directed towards the Arab regions by UNDP is $1 billion. “This is a new model for developing Arab world’s economies to tackle global challenges. The UAE is putting its expertise to use to boost sustainable development in the Arab states”, he added. The strategy will be presented in an international conference that will be hosted in AbuDhabi on December 16 and 17. The outputs will be presented to the Arab Leaders at the Arab Summit scheduled in March 2019 in Tunisia.